My cat is a very big, very long haired rascal. He returns from the garden with all sorts of things caught in his fur and if I can’t get them out he mats quickly and tightly which causes him pain. Due to his size he can’t always manage his own grooming, especially of his nether regions. After a bad experience with another groomer who treated him roughly and caused lots of little tears of his skin, he became much harder to handle since he panics if clippers or a brush are brought out. That’s when I called Anita. She was incredibly calm, patient and gentle, staying for several hours and working with him at his own pace, with lots of treats to reward him. She also gave me plenty of advice so I can maintain his care better myself and will now be coming regularly to keep him smooth and happy. Thanks so much Anita for your calm, compassionate and efficient service – we are both very grateful. If you have found yourself on this page, are a cat guardian who is looking for a Balham cat groomer then you have definitely come to the correct place. Why does our Balham cat groomer stand out? 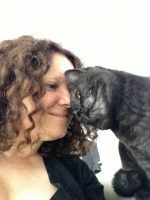 Aviva and pip were happy with their Balham cat groomer and you and your cat will be too!